I was reading an article in one of the Mumbai papers tonight about problems with pollution in the Kuttanad backwaters, so I did a little research on the topic on the Internet, and was saddened to see how bad the problems had become – and that I had contributed to that pollution in a small way through my night on the houseboat last week. I came across an article titled 'Thirst below sea level' written by M. Suchitra on a Kerala-based website called countercurrents.org, which describes itself as an alternative news site which “stands for peace and justice”. “A boat ride will take you around the vast and beautiful stretches of backwaters. 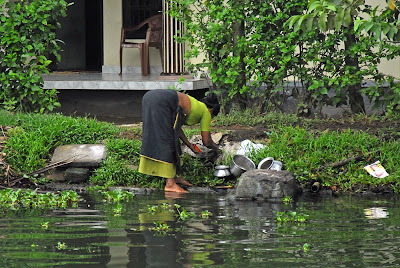 You will see women washing clothes, cleaning vessels, and collecting water for cooking and drinking — all from the same canal along which your boat speeds by. At places, toilet waste is let out into the same canal. Many households have toilets built with direct outlets into the canals and streams of the backwater system. You will also be aghast to see villagers using the dark oily water polluted by pesticides from the rice fields. Solid waste from the medical colleges at Alappuzha and Kottayam, sewage from the municipalities of Kottayam, Thiruvalla, Changanassery and Alappuzha, the oil and faecal waste from about 300 house boats which ply between Alappuzha and Kumarakom — all find an outlet in the Vembanad lake. "We have developed immunity to all poisons," Kuttappayi, an inhabitant of the Kainakari village islet says cynically. "Even a cupful of pesticide would not kill us. Our daily intake of poison through water is much more than that." Kuttappayi's friend, Sabu, echoes him: "We are so used to the highly polluted water that if we drink pure water we may get dysentery." Kainakari is only one of 54 villages in the backwaters of Kuttanad in central Kerala that face an acute water scarcity. Kainakari, with over 6,000 households and 30,000 people, does not have even one public tap to supply safe water. “More than 80 per cent of the people in Kuttanad rely on the contaminated canal water for their daily water requirements. About 40 per cent of them use the water without boiling it first. Interestingly, there are people who actually prefer the canal water to piped water. Says Chandramati, a housewife from a not-so-well-off family in Arayiram Kara, Kainakari, "If food is cooked in piped water, it gets spoilt by midday, but if it is cooked in canal water, it lasts till night." “Developmental interventions have, in fact, only worked to hurt Kuttanad's fragile ecosystem. For instance, the Thannermukkan bund was constructed across the Vembanad lake in 1975, constructed to obstruct saline water intrusion into the paddy fields during the dry season, and thus bolster paddy cultivation. "The natural flushing in the entire Lower Kuttanad affected by tidal movements has ceased and water levels in the upstream region have dropped," says Madhusoodana Kurup, a fisheries expert of the Indo-Dutch team that conducted a water balance study in Kuttanad during 1988-90. The result is that the waterbody tends to become stagnant, leading to pollution. Aquatic weeds have also grown to epidemic proportions. “The economic rationale of private owners of paddy fields therefore suggests that they convert their fields to non-agricultural purposes. They are not concerned about the ecological and environmental imbalances caused, the resultant societal loss of the economic functions of the wetland nor the economic value of the bio-diversity of wetland ecosystems. “The environmental and ecological crisis that Kerala faces is so acute that about two-thirds of the State's population does not have access to safe drinking water. 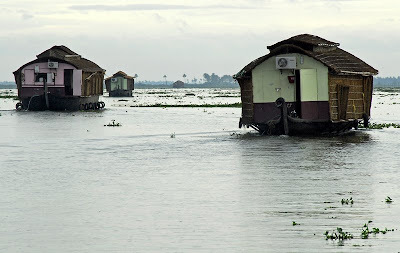 Kerala, one of the wettest regions in India, gets an average rainfall of about 300 millimetres of rain spread over a six or seven-month period. Despite this heavy rainfall, an acute drinking water shortage is felt even in the lower areas. “During the Sabarimala pilgrimage season, some four million people cross the Pamba river to reach the hill shrine, and the river turns into a cesspool of human waste, raw sewage, and domestic and commercial garbage. Because pilgrims defecate on the river banks and in the vicinity for miles together, faecal matter gets washed into the river water. “No wonder then, outbreaks of epidemics like rat fever and diarrhoea have seen an alarming increase. Over the past 10 years, diarrhoeal diseases resulting from inadequate water and sanitation have killed over 5,000 in Kuttanad. “Kuttanad is a testimony to misplaced and impractical developmental schemes. The backwaters itself are vanishing due to encroachment. The Vembanad lake has been reduced to one-third its size, with 65 per cent reclaimed by the government or people. The above extracts comprise about one third of the article on countercurrents (the full article is at http://www.countercurrents.org/en-suchitra150703.htm) but they serve to illustrate just how badly the Kerala state government has managed this environmentally sensitive region. Other articles that I read confirmed that land reclamation provides the greatest threat to the future of the backwaters, but also signficant is the pollution from the nitrates used in the rice fields (which is the main cause of most of the canals now being overgrown by water hyacinth – see picture above), as well as pesticides. And then there is the discharge from the rice barges and other tourist boats. Although these boats do provide employment for many, there are many residents of the backwaters that resent their presence with their noisy generators (used to power air conditioners and the satellite TVs at night for the comfort of the tourists on board) and the fact that they leave slicks of diesel and oil behind them (not forgetting the discharge from the toilets on board). 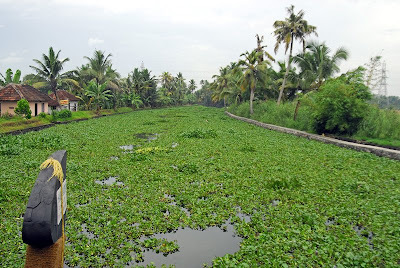 Apart from the tourism potential of this picturesque labyrinth of waterways (a few guidebooks call it the ‘Venice of the East’), several million people depend on the Kuttanad backwaters for their livelihoods. But they are ecologically fragile, and as the ‘Rough Guide to Kerala’ (which is the guidebook I took on this trip) puts it: “the delicate ecosystem of the Kuttanad backwaters have started to buckle under the weight of recent environmental pressures”. 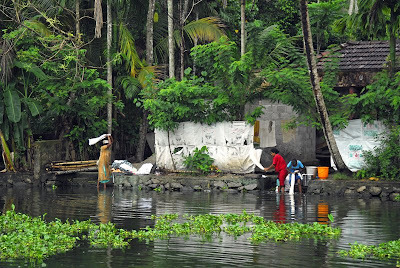 If the backwaters are destroyed through pollution (and government mismanagement), then the unique way of life that millions have followed for centuries in this amazing region will no longer exist. As M. Suchitra said in his article – all in all a tragedy.